Already know that you want in? Borrowing from the popularity of aerobics classes of the 70’s and 80’s, indoor cycling sprouted in the 90’s. Participation spread into the gym culture, with fans cycling on generic bare bones spin bikes on loud music in dance-like classes. Key players like “Spinning™” emerged, creating a new category of fitness activities. Indoor cycling was born. As the landscape of indoor cycling became more competitive, brands developed more advanced classes that soon evolved into full-on experiences. Those early indoor cycling classes specialized, as we witnessed the proliferation of standalone centers known for their “fitness experience” like SoulCycle and Flywheel. Sessions became more complex, combining elements of engagement, entertainment and effectiveness to provide a complete experience to the customer. 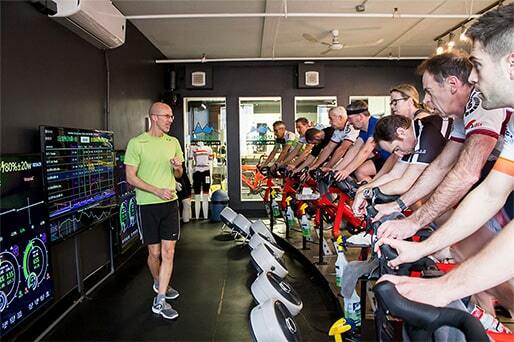 The immersive classes, led by upbeat trainers in a nightclub atmosphere, provided an intense workout as well as an opportunity for riders to connect. The formula was on point, almost addictive for some members who thrived on the exhilarating feeling of having pushed their limits and loved the cult-like vibe of the community. The dependance to these indoor cycling classes was real, as most riders remain clueless on how they could train better and smarter to achieve their performance goals since little to none reliable education was ever provided in this setting. More recently, technology helped nudge this progress along with more fine-tuned micro-adjustable bikes and real-time wireless connectivity to power, speed, cadence, and heart rate. Today’s landscape of indoor cycling proposes highly specialized offerings that have borrowed from high performance sport and use advanced concepts of exercise physiology. It didn’t take too long for the fitness industry to adjust. Many centers, this time focusing on very specific cycling “athlete-centric” approaches, sprouted up all over the world. Their specificity is both their strength and their biggest flaw, as their trainings are so specific only a very limited group of cyclists can benefit from them. 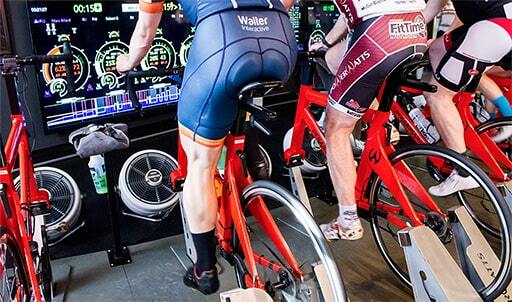 Between almost addictive indoor cycling classes that make you sweat without getting you closer to your goals and a complex “athlete-centric” training program, PowerWatts is the exception in the indoor cycling world. Our team believes indoor performance cycling is a fitness and performance tool that can help anyone achieve their goals. At P2, the PowerWatts center combines cutting-edge technology to give riders an unforgettable experience – one that will challenge their mind, determination and body. Every ride is designed to engage and entertain cyclists with a specific and efficient program that maximizes results in a short amount of time. PowerWatts at P2 is the training all cyclists are dreaming of. Fully customized for each cyclist, yet providing the motivation of riding in a group setting. First, the bikes. Forget about the awkward spinning bike-like frame. To be able to push through the training, you want to be as comfortable as possible on your ride. 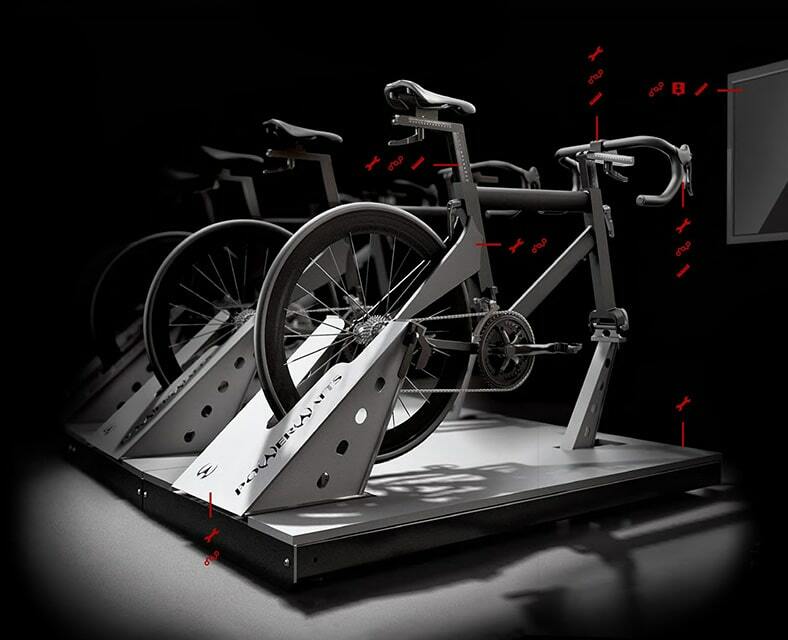 PowerWatts leverages proprietary hardware with completely multi-adjustable real indoor training bikes on suspension systems. Your ride will be as smooth as if you were riding your own bike. Then, the route. To increase your performance, we know we need a personalized program. With PowerWatts integrated software (cpX), every rider gets a targeted specific training based on his or her capacity. The indoor cycling “spin-ophiles”,the cyclist obsessed by his watts or the “uber data-driven geek” triathlete can all find value in a PowerWatts workout. Finally, the people. We all know how much your co-riders matter. They will often be the ones to take you up one more hill or sprint one more time, whether IRL or in a virtual setting. The innovative technology used by PowerWatts allows anyone, at any level, to train together, using a training methodology that is second to none. All riders can therefore benefit from the group energy and motivation without compromising on the quality of their training. PowerWatts at P2 has a mission to empower through education. Beyond an efficient workout, each cyclist gets to learn the art and skill of cycling efficiently by understanding fundamental principles such as proper shifting, gearing and cadence. Cyclists also get the opportunity to refine their technique and linger on the details that will make a big difference in their performance, like the finer points of how a pedal stroke feel and ways to better dose their efforts to sustain through the whole ride. Our coaches are not cheerleaders. They possess an impressive skillset and knowledge of high-performance training and care about long term results. You’ll often find them explaining to riders why they’re training the way they are. We believe in the power of education, as we’ve witness how understanding the rationales behind each drill helps our riders get the motivation to power through a particularly difficult route. Difficult, yet not impossible. The ability to measure and prescribe the training using power in watts allows coaches to take the rider through a highly individualized program, one that will be challenging but not discouraging. As riders experience different workouts and with the guidance of the coaches, they come to understand concepts like FTP power, Critical Power and W’ balance. Coaches also teach clients about their physiology and help them relate to the concepts of anaerobic power, aerobic threshold, lactate tolerance and other physiological principles they can then apply on their own. Imagine going for a group ride with some of the most dynamic cyclists, riders of all levels who got one thing in common: they’re as motivated as you. The game changer here with PowerWatts is you all get to ride together, as each cyclist is engaged with their own specific tasks based on their personal capacity and not anyone else’s. All the fun of powering through together, without the downside of having to find a sustainable pace for everyone. The strong cyclists won’t be left asking for more and the newbies don’t have struggle to finish the ride anymore. How do we make it work? 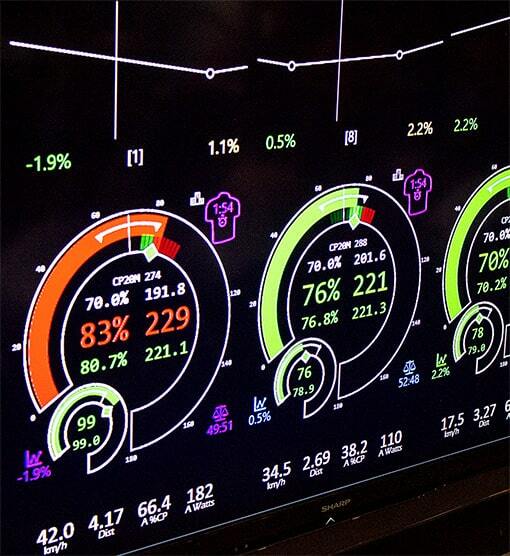 Each rider has a customized heads up display showing their own specific data, data the coach leading the class can manipulate even in a group setting. The unique visual interfaces that each rider interacts with create such an engaging environment that an hour flies by. Beyond getting an individualized program, cyclists can rest assure: they won’t get bored. Indoor cycling training, like any other training program, can become monotonous if you don’t switch it up often. PowerWatts’s unique and propriety software is designed to offer so many alternatives it’s almost impossible for riders to do the same training twice. If you’re more the kind of cyclist who thrive on competition, PowerWatts offers the possibility to riders to either “play” within their own world, or compete with others in the class. So yes, you will have the opportunity to beat your friend on that final stretch. Anyone who has ever tried riding indoors at home alone can attest how inherently boring it is. The amount of motivation needed to push through difficult intervals on a roller by yourself in your living room is humongous. With variability and play as a cornerstone of the training program, PowerWatts gets cyclists excited about indoor cycling (and stay in much better shape for those days you get to play outside). If having fun is good, getting big fitness gains in a short amount of time is better. PowerWatts is specifically designed for time-crunched people who only get one hour to train and want to make the most out of it. We know HiiT (high intensity interval training) is efficient, especially when we’re tight on time. But did you know that PowerWatts pioneered the HiiT (high intensity interval training) model way back in the late 80’s and early 90’s when no one understood how effective a tool it was to improve fitness? 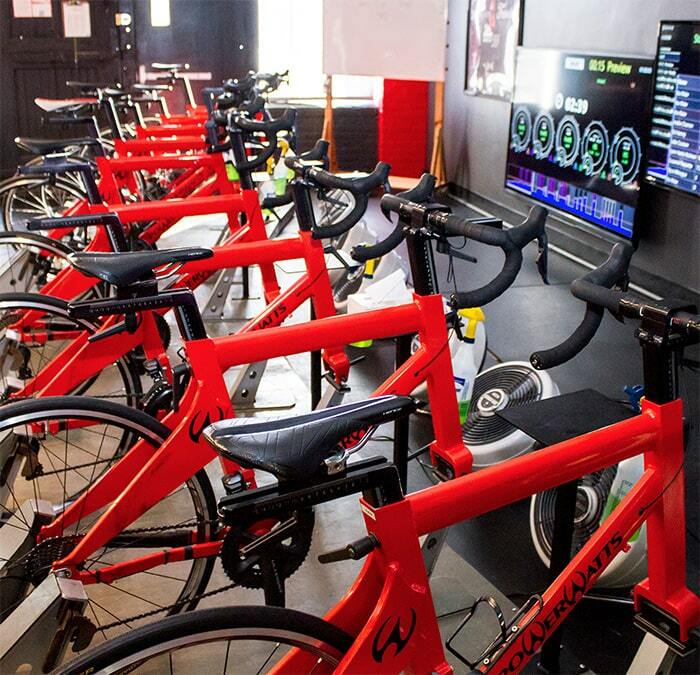 For more than 20 years, PowerWatts has been using the HiiT method to train cyclists. With the advent of heart rate monitors and power meters, along with more advanced wireless technology, we can now live track a myriad of metrics. PowerWatts measures work, speed, cadence, heart rate and many other variables, making each class a technology driven experience. 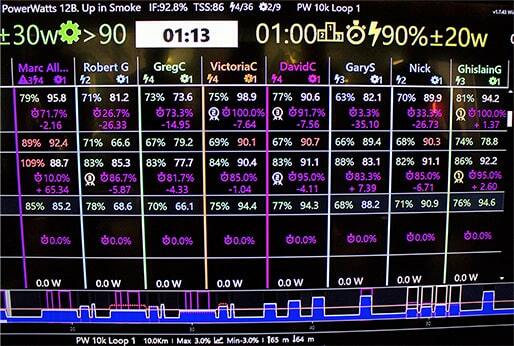 Using this data to create HiiT cycling workouts more efficient and precise than ever, PowerWatts has become one of the industry leaders. At first, training with numbers can look intimidated. Do not fear, it’s easier than you think. The cpX software for PowerWatts has created visual interfaces easy to understand. Riders get access to an individualized power-based training without having to set up anything themselves. Our coaches are also well versed in the use of our software and make sure every rider can follow along. Using the latest technologies and a proven training formula, PowerWatts is an attractive workout for cyclists in a hurry who want to optimize their time and training. With the ongoing rise in popularity of cycling, many athletes, cyclists and thriathletes are also looking for an alternative to maintain or even improve their fitness in a very specific way over those long winter months. PowerWatts allows them to gain power and develop a more efficient pedal stroke, both incredible assets when the first group rides come along in spring. HiiT training is also renowned for its benefits regarding weight loss. This method of training applied to cycling means a rider tends to burn more calories per unit of time with short intense intervals vs riding at an easy aerobic pace for the same duration. Using watts, we’ve been able to measure the energy used during a class. It’s estimated that a rider will usually burn between 6-14kj/minute during different times of the session. Besides the interesting energy deficit created in the session, one of the biggest advantages to HiiT is the “afterburn effect”. The increased intensity during the workout is such it will act as a high stimulus on the body, causing it to increase the metabolism significantly long after the workout is done. This will lead to a post exercise calorie during recovery, an added benefit to weight loss/fat burn of PowerWatts classes. Before the first workout, each rider is put through a series of different power tests to determine some baseline power variables. 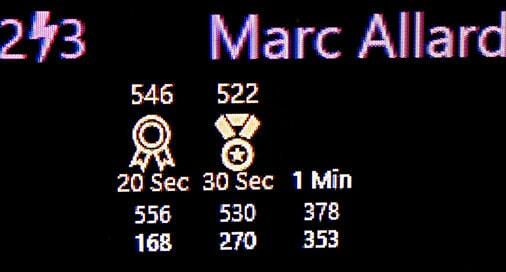 The cpX software then uses those metrics to individualize the specific power prescription. Riders can do a ramp or step test, or even just a shorter steady state effort of three minutes, to predict where to start with training. In combination with the data provided by the software, coaches will also use RPE, the rating of perceived exertion, a subjective measure of how hard you are working, to adjust the power prescription. Improving on any fitness activity requires consistency, variability, individualization/specificity and overload. Each of these principles is addressed in PowerWatts at P2.